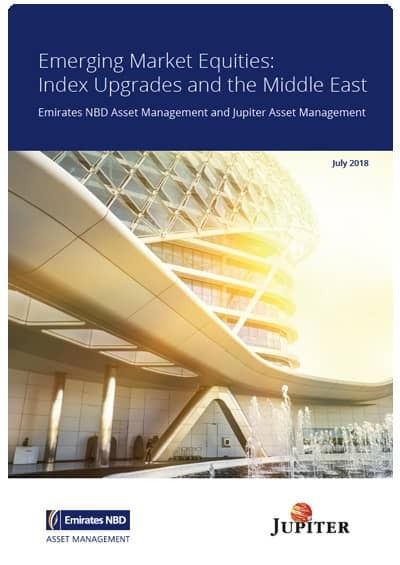 With structural and economic reform in full swing in the MENA region, equities across Egypt and Saudi Arabia are capturing the imagination of Emerging Market (EM) investors, according to co-authored white paper “Emerging Market Equities: Index Upgrades and the Middle East”. Data over a 30-year period suggests that if investors purchase EM stocks in the current Price-to-Book (P/B) range of 1.6x to 1.8x, this has typically resulted in approximately a 50% upside over the subsequent five years. Moreover, since EM indices are skewed towards large-cap companies and have high concentrations in certain countries and sectors, the opportunity for investors lies in building a portfolio that covers small- and mid-caps. In 2018, anticipation of the now-confirmed MSCI upgrade for Saudi Arabia has driven the Tadawul All Share Index (TASI) up 15% year-to-date, in stark contrast to the MSCI EM Index itself, which is down 2% for the year. At a weighting of approximately 2.6% and with 32 securities selected, the importance of the upgrade as a catalyst for the Saudi equity market cannot be ignored. The outlook for Egyptian equities is also positive, with the EGX30 index potentially trading back to its 2014 high, it offers investors a potential return of 40-50% over the next two years. As the Egyptian pound strengthens, companies reliant on imports are set to benefit from improved earnings.